Bla bla bla bla bla bla bla bla bla iPhone. Bla bla bla iPhone bla bla bla bla bla bla. Bla bla bla bla bla bla bla bla bla iPhone. Bla bla bla iPhone bla bla bla bla bla bla. Bla bla bla bla bla bla bla bla bla iPhone. Bla bla bla iPhone bla bla bla bla bla bla. iPhone. June 29th. Yesturday. Bla bla bla bla bla. With all the innovations surrounding the iPhone, we didn’t expect a product like the Bona-Phone to come along and steal the limelight. Featuring breakthroughs like “touch-bone” dialing and easy-to-hold shaft design, the learning curve of the $30 Bona-Phone is considered much lower given its organic, intuitive design. Trust us, if Meredith Viera was demoing the Bona-Phone on the Today Show, she would have had no problems “answering” the thing. If you happened to catch the original look for Valve’s The Orange Box (which includes Half-Life 2, Episodes 1 and 2, Portal and Team Fortress 2), you’ll know it was just a generic Word font on an orange background — what we have now is much better. TeamXbox says this is the final box featuring Gordon Freeman (who apparently has time to put good product in his hair and keep the goatee trim), the symbol for Portal and Heavy Weapons Guy with Sacha. In case you missed it, the Black Box is no more, so PC gamers will get The Orange Box at $49.99 instead of the PS3 and Xbox 360 console price of $59.99. The individual components will be offered through Steam as well for PC owners to pick and choose. For console owners, there is a lot of stuff packed into The Orange Box, especially if you’ve missed out on the saga of Half-Life 2. We’re going to also take this opportunity to guess that Episode 3 will be a PSN and XBM download. Unless Valve decides to come out with The Orangier Box, which will have six games and an updated version of the original Half-Life … it could happen. 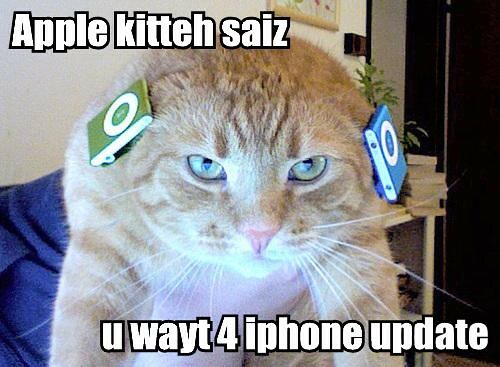 apple-kitteh-saiz-u-wayt-4-iphone-update, originally uploaded by . t bird ..
Now this is Sterling the kat! AT&T customers seeing sudden boost in EDGE speeds? Shortly after beginning the shutdown process of AMPS and TDMA networks, and just hours before the launch the EDGE-capable iPhone, a number of users are reportedly seeing dramatic increases in EDGE throughput. After questioning whether the mobile was actually using WiFi, a New Yorker began to see if fellow AT&T customers across the nation were also noticing the substantial boost in speeds; sure enough, it looks like quite a few others are seeing speeds upwards of 200Kbps. Of course, the usual banter over the legitimacy of speed tests conducted on mobiles inevitably ensued, but we’re leaving it up to you. So, dear readers, hop on AT&T’s 2.5G highway and give it a go, but be sure to return and let us know whether the increases are for real. Update: We tried some speed tests on an EDGE handset ourselves, and though it’s been a little inconsistent, we’ve been shocked to find a number of runs over 200kbps. True, these kinds of speeds are theoretically possible (actually, little known fact, the ITU technically defines EDGE as a 3G standard), but we’d never expect to see them in practice. Should make the iPhone’s browsing experience a little more bearable if it holds up! The Telcos have become the biggest obstacle to the development of new technologies and services. They have become the most backward elements in our society when it comes to rolling out new technologies, applications, and services. They have filed lawsuits to stop public wireless networks, and they constantly seek to control anything that could threaten their markets. They maintain the digital divide by keeping Internet access prices far higher than they should be. They control the cell phone and all of its features, disabling built-in functions when it suits them. And they control the services can be offered over their networks. They don’t compete against each other, their pricing is almost identical, almost cartel-like. The only competitive activity they engage in is in advertising campaigns. I’ve long wondered why does my cell phone bill continue to increase year after year–yet the number of hours I have to talk hasn’t increased, the same black-spots are still there, and the overall service hasn’t improved one iota. As a veteran journalist covering the business of technology, I know too well that the Telcos have been aggressively adopting powerful communications technologies, such as VOIP, that have lowered their key operating costs significantly. So how is it that our Telco bills continue to increase year after year? It seems as if that cell phone in your pocket, nestled against your wallet or purse, is somehow sucking ever more money out and sending it to the Telcos–with little to show in terms of new services or added value. Like everyone else around here I’ve been fascinated by the coming of Apple’s iPhone. But while many focused on keyboard issues, or battery life, my question has been: How will AT&T disable or enable the iPhone’s Wi-Fi capabilities? Reading the early reviews, it seems that AT&T hasn’t done anything to prevent the iPhone from accessing Wi-Fi in public hotspots, or at home. And AT&T doesn’t seem to have much control over what applications can be run on the iPhone. This great news because it means we will see a tremendous amount of innovation, and disruption. The innovation will come from Silicon Valley and beyond, as startups and others develop applications and services delivered over the wireless Internet directly into people’s pockets. The barriers erected by the Telcos will be gradually removed as Wi-Fi hotspots become more common and eventually ubiquitous. The disruption will hit the Telcos as they lose their control over the gateways to the Internet. Their pain will be compounded by the expensive licenses paid for wireless spectrum while Wi-Fi uses free unlicensed spectrum. The disruption for the Telcos will accelerate as Wi-Fi networks are built out, and as roaming technologies for Wi-Fi, such as those from Packet Design and elsewhere come into play. Steve Jobs has hit another one out of the ball park. For Apple, its a win-win, and win again strategy. It represents brilliant positioning. If you look at the the TV commercials for the iPhone you might even wonder if it Apple needs AT&T. There is nothing shown in those commercials that requires a cell phone connection. The TV commercials demonstrate the iPhone displaying family photos, allowing users to view a movie, search for a restaurant, view a Google-like map location. The AT&T logo appears for less than a second at the end of the ad. And about a second of tech time is all that Apple requires from AT&T. Apple could have released the iPhone as a Wi-Fi phone but then its features would only work in Wi-Fi hotspots, which are patchy and unevenly distributed. By linking up with AT&T Apple can offer the full integrated set of iPhone features in any urban location. As Wi-Fi is built out, as WiMax comes in, wireless Internet will be ubiquitous and AT&T’s network becomes less and less necessary–without affecting the quality of iPhone services. The money that was paid to AT&T now becomes available for other services. Interestingly, Apple stores are selling the iPhone without selling an AT&T two-year calling plan. I doubt AT&T stores will allow people to walk out with an iPhone without a calling plan. Will others be able to mimic the success of the iPhone? It is doubtful that other carriers would allow a similar arrangement. But that won’t stop companies such as Nokia, Samsung and others from selling unlocked phones with Wi-Fi enabled features directly to customers. They will benefit from Apple’s lead. Without the Telcos limiting access to the Internet, and trying to control handsets, services, and applications, we will see Silicon Valley launch into its next big boom cycle. I’ve been here since 1984 and noticed that each Silicon Valley boom cycle is larger than the one before, and affects more people than the one before. This next one is going to be absolutely massive, more like a sonic boom, and it will shake things up the world over, imho.